Put simply, we are an enabler. That means we help businesses from a variety of sectors to come together and help shape the destiny of the North by speaking up on the big-ticket issues affecting enterprise across our region. We want to challenge, support, and provide ideas about what our members want in the North, all to ensure the Northern Powerhouse becomes a reality. Of course, one of the single biggest factors holding the North back is our creaking transport infrastructure, and we have been happy to support England’s first Sub-national Transport Body, Transport for the North, in the development of their plans. If we are to truly see the North come together and realise it’s potential, then we need a transport system that is developed on an understanding of where the opportunities are, not just for business, but for people, because they go hand in hand. We want to see better, more open labour markets, so somebody who lives in Lancashire can work in West Yorkshire, for example. This means that people will have much greater opportunities, and businesses will have much more access to talent. 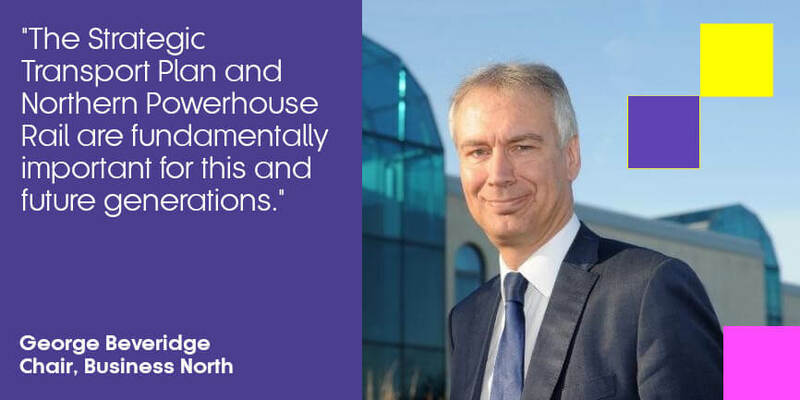 As Business North, we feel that there are three priorities to improve transport across our region; the first is understanding the economic benefits of transport investment. We know that Transport for the North is including this in its analysis, and this is crucial if we are to properly understand how transport can support transformational economic growth across the North. The second is a general increase in transport infrastructure spending, which is intrinsically linked to the first point insofar as transport can provide the means to unlock the potential of many of our towns and cities. The third is further devolution; we’ve already seen the huge benefits devolution has had, not only in understanding and delivering better services, but by providing regions with a strong voice that can be heard outside of their respective areas. Our new Metro Mayors, from Andy Burnham in Greater Manchester and Steve Rotheram in the Liverpool City Region, to Ben Houchen in the Tees Valley and Dan Jarvis in the Sheffield City Region, are each working hard at trumping the merits of their areas, and the North as a whole. In the short term, we very much support the Strategic Transport Plan, including Northern Powerhouse Rail. These are both fundamentally important for this and future generations, the businesses they will work for and those new innovators and entrepreneurs that will help drive the North forward for years to come. The North is a great place to live, and by working together we can make it even better. That is very much behind our approach as Business North and why we support Transport for the North.